This article discusses the many types of Phoenix shuttle services available. There are many daily shuttle bus services that can connect you from Phoenix to Flagstaff, Sedona and the Grand Canyon. These services run daily and often more than ten times a day. They can collect you at Phoenix Sky Harbor airport or at your house or hotel. Services operate both ways and have room for luggage. You can also bring pets, snowboarding equipment, extra luggage and bicycles at an extra cost. A shuttle bus is a great way to get to and from the airport. These are shared services and are a more cost friendly way of traveling than a taxi, limo or town car. They leave from the Phoenix Sky Harbor Airport Van Service area. For getting to the airport you must arrange in advance for the shuttle service to collect you at your house or hotel. These services are available in the following areas: Scottsdale; The Greater Phoenix area; Carefree; Cave Creek; Gilbert; Tempe; Chandler; Peoria; Laveen; Mesa; Fountain Hills; Goodyear; Glendale; Surprise; Queen Creek; Sun City and Sun City West. Other destinations may be available on a less frequent time schedule. For more information please contact North America Car service. Charter Phoenix shuttle services are great for sporting events, parties, proms, weddings, church groups and corporate needs. There are a huge range of travel options at affordable prices from standard shuttle buses that can travel up to thirty passengers to smaller shuttles with first class style seating. There are also shuttles that can cater for passengers with disabilities. A shuttle bus is also perfect for smaller businesses who need to transport employees or customers but don’t have the capital to invest in their own shuttle and driver. You can also arrange for large amounts of luggage or equipment to be transported with you. 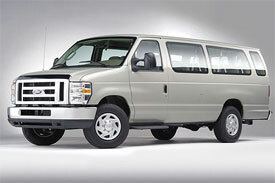 As well as charter buses you can also rent a shuttle bus for your own use.